Last week whilst dashing in-between the rain showers, we managed to get a little summer fix when we headed down to Stila’s new perfume launch. 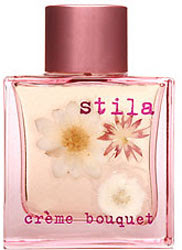 ‘Crème Bouquet’ is Stila’s brand new scent and has a light, vanilla smell that encapsulates summer time. Packaged in an ethereal pink bottle and reasonably priced at £30 for 50ml, it’s the perfect scent to chuck into your bag to freshen up after a day in the sun. Not only did we preview Stila’s fresh fragrance; but Sarah Lucero, creative director behind the brand also gave us the down-low on the latest make-up range. Stila are releasing a series of great lip glosses called 'Stay All Day Liquid Lipstick'. Unlike normal lip tints which have the tendency to wear off, these lip glosses are silky to apply and once dry, last all day. They're just £15 each and come in 10 different shades, including our favourite 'Aria’, which gives you the vampy goth look that Katy Perry is sporting at the moment. After Sarah had sampled the product range on two models, we were then led through to the next room, where the season rapidly changed – to Christmas! A cute eyeshadow palette called “In the Know” caught our eye and entered our Christmas lists. The palette contains ten matte eyeshadows which create perfect smokey eyes whether you want them natural or heavy. Set in snow-flaked shaped packaging, it will make a great stocking filler. However, for now it is the summer, so time to get your hands on the scent that will hopefully get that sun shining! To buy the featured products, or for more information; visit stila.co.uk.